I have heard some talk recently in our community about the upcoming medical marijuana legalization. I was really surprised by the range of opinion on the subject. While talking to one vocal opponent, I imagined what they must be picturing —an empty snack wrapper drifts slowly across the courthouse lawn, past shuttered store windows and down the cold, empty sidewalk. Small streams of white smoke drift lazily from second story windows to mingle with the bitter winter air. A ragged line extending outside of one local storefront, the waiting crowd shuffling in place listlessly. How many of us picture something like this when we talk about legalized medical marijuana? Are we in store for drug-fueled panic in the streets? Carnage in the town square? Will we notice any difference? In all seriousness, what does legal medicinal marijuana really mean to Highland County? Highland County will soon be the home of a single approved medical marijuana dispensary that will cover Southwest District 6 region, which includes Adams, Brown, and Highland counties. I am not a marijuana expert, but in talking to a few others in our community, I think we share some common concerns (and maybe post-apocalyptic visions) for Ohioans on marijuana. Through my work at the Highland County Health Department, I have had a chance to be a little closer to the issue than some, so I want to share with you some of the potential negative health impacts of marijuana use in Ohio. Regardless of any of our personal, medical or political opinions on marijuana legalization, it is here, and likely to stay. It certainly appears that medicinal marijuana has significant health benefit to some people, for some conditions. This is one of the main reasons that recent national surveys show that 61 percent of Americans say that marijuana should be fully legalized. When this is broken down by political party, Democrats favor legalization to the tune of 69 percent, while Republicans favor it by 43 percent. Older Republicans are especially against legalization, with only 30 percent favoring it. The younger generation simply sees this topic differently, and because of this, legalization is likely to continue to expand in Ohio as well as across the nation. Before I get in to the probable impact of medical marijuana, there are some very good summaries of the current Ohio law. If Ohio follows the general trajectory of Colorado, here are some real-world consequences that we might expect. Colorado has seen an increase in traffic fatalities since the passage of legalized marijuana laws. This is a very complicated subject, in part because a driver can test positive for marijuana use long after that use actually occurred, and it may not be a true factor in the traffic fatality. Several conflicting studies have been released regarding driving under the influence of marijuana, so the jury is still out. If we look back to the early years of medical marijuana in Colorado, there was actually a decrease in marijuana related traffic fatalities from 2008 to 2013, but an increase was seen as soon as full legalization was in place. Since full legalization in 2013, Colorado reports an increase of 151 percent in marijuana-related traffic deaths, compared to an increase of 35 percent in overall traffic fatalities. For Ohio’s medical marijuana roll out, traffic impact remains to be seen. Hopefully, like Colorado, we will not see any significant increases in traffic fatalities from medical legalization. This does remain an area of significant concern, however. While smoking is definitely not permitted under Ohio law, edible forms of medical marijuana will be an option in Ohio. This leads to concerns about the potential for accidental poisoning of marijuana by children and adults who were not aware that the edible item contained marijuana. When we see marijuana edibles shaped like gummy bears, it isn’t hard to see an increased potential for accidental ingestion by children. Edible marijuana products also take longer to influence someone after they eat them, which can cause people to take additional doses or portions of the edible product than is recommended because they think it isn’t working. Accidental poisoning and overuse of edible products will result in more people going to local EDs, calling EMS, and seeking help at other health care agencies. We will also likely see an increase in health issues related to the use of marijuana concentrates. Concentrated cannabinoid compounds can be significantly more potent than natural plant material, and can cause more pronounced physical health effects. Colorado has seen, and continues to see, an increased ED visit and admission rate related to marijuana use, and we should expect an increase as well. There are some good rules in place in Ohio to limit marijuana access to children. Despite these rules, history shows us in Colorado and elsewhere that we will see an increase in youth marijuana use rates as the state implements medical marijuana legalization. Interestingly, marijuana use is seen as “not as risky” as tobacco and e-cigarettes use by teens. Many tie this perception of risk to media portrayals. Anti-smoking ads are common, while marijuana use tends to be shown in a positive light by movies and TV programs. Approximately 20 percent of Highland County high schoolers report some use of marijuana over the past year. We should expect these rates to increase as in-home access to marijuana becomes more prevalent. There is significant evidence that shows early use of addictive substances leads to future use, so this is something we need to watch closely. Many businesses, especially in the industrial and manufacturing sectors, no longer drug test for marijuana because they may find trouble maintaining staff levels as a result. Adding to the difficulty with marijuana testing is the longterm nature of many testing results. If a staff person takes a trip to Vermont and enjoys some perfectly legal Vermont marijuana, they might still test positive 30 days later, long after they return to work. Additionally, though medical marijuana is legal in Ohio, workplaces can still individually decide not to allow any marijuana use by staff, even if prescribed by a doctor. Human resource officers across the state continue to work on policies for how to address medical marijuana. There are many local patients and health care providers who are excited for the opportunity to have access to medical marijuana. Personally, I think marijuana has a place in medicine, and some people will truly benefit from its availability. There are going to be some negative impacts, and there are a few things we can do now to prepare for and lessen those impacts. Measure it, so we can manage it – The Ohio Department of Health, along with local health departments across the state, need to follow the example of Colorado, California, and other states in measuring the impact of marijuana policy changes in Ohio. This needs to start now, so we have a clear baseline for comparison down the road. By having a clear plan for data collection, we can create effective programs and tools to manage some of the negative impacts of medical and possible full legalization in the future. My recent conversations with Ohio Department of Commerce and Ohio Department of Health indicate that no state program currently exists to measure these changes. This is a problem. Educate our youth – Today’s youth do not view marijuana use as a significant health risk. We need to develop health education outreach that changes this perception. There is a substantial amount of evidence that early marijuana, tobacco and alcohol use can lead to later substance abuse problems. Highland County has enough substance abuse already. We need to work to change the perception of risk that young people have of marijuana. Monitor labeling and packaging – In order to reduce accidental poisoning, marijuana-related products need to be clearly marked. Ohio marijuana manufacturers are required to use childproof containers and proper labeling, and we need to ensure that these rules are carefully followed. This requires consistent and careful review of these products, as well as education efforts for controlling access within the home. Conclusion: We are not the first state to go through this process, and we will not be the last. There were no weed riots in California, no burning villages in Vermont, no massive crime waves in Colorado. We know that there will be questions, some confusion, lots of weirdness, and endless opportunities for weed-related jokes. But we are going to figure things out, as long as we have some real discussions about this issue at home, at school, and as a community. Medical marijuana will do some good for people dealing with a host of health issues, and I am happy to see these folks with new tools available to them. It also poses some real concerns that we need to carefully and thoughtfully consider as this moves forward. So let’s watch closely, learn, and talk about it as Ohio enters the era of legalized marijuana. 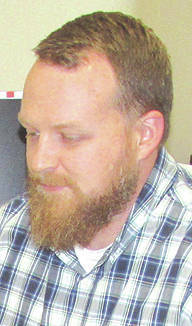 Jared Warner is the health commissioner for the Highland County Health Department.